If you've been shopping around for a 7-passenger crossover that has a sculpted design, sleek cockpit and room for all your family, look no further than the 2015 Mazda CX-9. Cutter Mazda Waipahu in Waipahu, HI, serving the surrounding cities of Wahiawa, Kapolei, and Pearl City, has a 2015 Mazda CX-9's in stock just for you. Step into our showroom and let our knowledgeable staff negotiate a great deal for you on a new Mazda CX-9. You'll be the envy of the block when your neighbors notice this gorgeous car parked in your driveway! The multiple-award-winning Mazda CX-9 continues its noble tradition with the 2015 Mazda CX-9. Powering this sporty SUV is a 3.7L, V6 engine with 273 hp. A 6-speed FWD or an AWD automatic transmission work in tandem with the engine to give the Mazda CX-9 its smooth and quiet ride. And when you're taking this great crossover out on excursions or family trips around the island, you might need to haul something behind you. When it comes to towing capacities for mid-size crossovers, the 2015 Mazda CX-9 really shines. If you're looking to tow a boat to sail the Pacific or a trailer to camp on the beach, the Mazda CX-9 FWD offers optional trailering equipment with a maximum tow capacity of 3500 lbs. 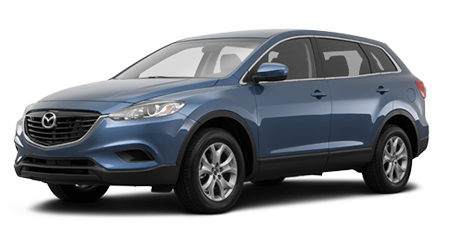 The 2015 Mazda CX-9 comes in three trims that are packed with amenities -- the Sport, Touring, and Grand Touring. Standard features on all models include dual heated power side mirrors (optional on the Sport), rear privacy glass, a roof spoiler giving the Mazda CX-9 its distinct, cutting-edge look, dual exhausts, and 18-inch alloy wheels (which move up to a trendy 20-inch on the Grand Touring.) Inside the cutting-edge cabin you'll enjoy three-zone climate control, tons of interior illumination including entry, map lights, dome lights, and steering wheel buttons, and tons of storage, because you and your 6-passengers have a lot of gear. A 5.8-inch touchscreen display and an audio system with 8-speakers, HD Radio, and Pandora, will help you rock down Hawaii's highways in style. You also get iPod integration and SiriusXM, so you'll never be at a loss for music. Bluetooth is also standard. Both the Touring and Grand Touring trims offer an optional package which includes a power sunroof, Bose stereo surround system, and navigation. The 2015 Mazda CX-9 is a force to be reckoned with -- and just a really cool crossover that you'll be thrilled to be driving. If you live in Wahiawa, Pearl City, Kapolei or Waipahu, Cutter Mazda Waipahu is ready to give you a great deal on this all-around great vehicle -- so stop by and say hello to us today!